75 Million Millennials (age 23-37) are predicted to account for 40% of U.S. new vehicle sales by 2020. According to J.D. Power millennials purchased just over 4 million vehicles in 2016, 29% of the new vehicle market. Millennials are the first generation to enter their teen years as Digital Natives. Digital Natives came of age with the internet. Millennials rely on digital tools to facilitate social interaction and purchases. They communicate with friends and family via a host of instant message and chat apps. They buy airline tickets on Kayak, share the cost of a restaurant meal using Venmo and use Apple Pay to shop for fashion. They book vacation stays at Airbnb using a smartphone and find a date by “swiping right”. This smartphone-enabled generation expects a fast, streamlined process that’s as close to friction-free as possible. Millennials are accustomed to a subscription or pay as you go style of transaction. Withholding payment information signals a retailer is not in tune with how this generation acquires the things that are important to them. Not having accurate, VIN specific payments on a dealer website makes it more difficult for members of Gen Y to get some of the most important information they require to select and own or lease a vehicle. This generation doesn’t negotiate, they compare. It’s no surprise that programs offered through True Car, Costco and others continue to gain in popularity among all age groups including millennials. These programs promise a great value, transparent and upfront pricing and a fast, no-hassle experience. Costco alone facilitates the sale of over 400,000 cars annually. 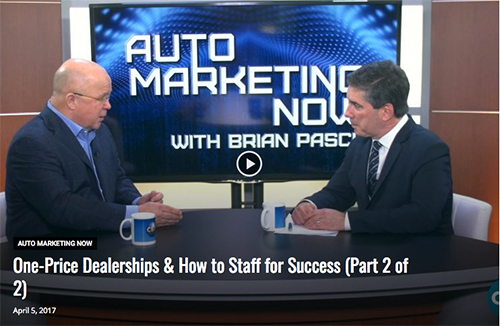 These programs exist and flourish because dealers continue to withhold information and insist on herding potential customers through an outdated sales process. The irony is that rather than providing price and payment transparency directly to shoppers, automotive retailers are paying fees to Costco and others who then offer transparency on behalf of the retailer. Based on the popularity of these programs it begs the question: why don’t dealers cut out the middleman and offer transparent pricing and a hassle-free experience to all of their customers? Millennials will soon be the largest segment of new car buyers. They value friction-free, mobile-enabled transactions. Transparent, hassle-free programs offered by third parties are gaining popularity. The unintended message dealers are communicating is that Costco is trustworthy, car dealers – not so much. Now is the time for auto retailers to align their business model with the needs of the first generation of Digital Natives. The alternative is to continue to pay Costco and others to do it for them. Do you like Doritos? If you like them a lot you probably don’t want to run out of them. You may like them enough that you don’t have the patience to drive to the store to replenish your Doritos stash. You may also find ordering online is just too much trouble to secure your precious glow in the dark orange goodness. You want on-demand Doritos. And, Amazon knows this. Because Amazon is the master of Faster, Simpler, Easier they have reduced the friction in speedy Doritos acquisition so that when you press the Amazon Doritos Dash Button an emergency load of nutrient-free, finger-staining, fluorescent crunchiness is headed your way. Let’s not confuse purchasing a bag of snacks with acquiring a new car. They are vastly different transactions. But let’s also not ignore how Amazon and other companies have raised consumer expectations about how easy it should be to purchase things we use every day. Study after study shows that negotiating the price of a car creates strong emotions including fear, anxiety, frustration and disappointment. Add the confusion and tension that customer feel when they enter the finance office and we can see why customers don’t purchase vehicles more often. According to the 2015 Driving Sales Consumer Experience Research commissioned through DrivingSales University 64% of consumers surveyed said they would buy more often if the dealership experience wasn’t so difficult. According to the same research fully 99% of respondents said they expected a hassle when visiting a car dealership. We are still transacting car sales as if we were horse traders. In the era of horse trading little was known about the history of the horse, there was no warranty or return policy and the buyer assumed all the risk. Horse trading exemplified the principle of caveat emptor – buyer beware. Today information availability is symmetrical. Unlike the pre-internet era, buyers have virtually the same information as sellers do. Isn’t it time to introduce true price transparency and start focusing on an extraordinary guest experience not setting up an adversarial relationship where we haggle over a smaller and smaller front end margin? As stated in the subtitle of this article “…no haggle pricing is the future of auto retailing.” New retail concepts are entering the market. Carvana, AutoNation USA, Carite, CarSense, Echo Park, Sonic One, CarBiz are all racing to bring a faster, simpler easier purchase process to consumers. While these concepts all vary in execution, they all have one common foundation: no haggle pricing. Progressive no-haggle dealers such as Rydell Chevrolet, Apple Autos, Walser Automotive Group, Morrie’s Auto Group, Mullinax Ford, One Toyota, CarMax, Sonic One, Grappone Auto Group, Manchester Honda, Holler Classic, LeHigh Valley Lexus and many others are part of a group of legacy dealers who left negotiating behind to improve the customer experience and sell cars in volume. The simple fact is there are no innovators in retail auto introducing a new concept that relies on negotiating prices. Faster, Simpler, Easier is going to win. 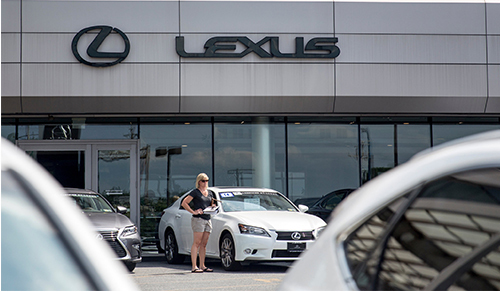 Curious about no haggle pricing and the one-price business model for car dealers? 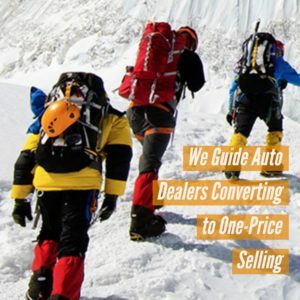 Ryan Adams Group Guides dealers who are converting to one-price selling. Take a look at how we can help. 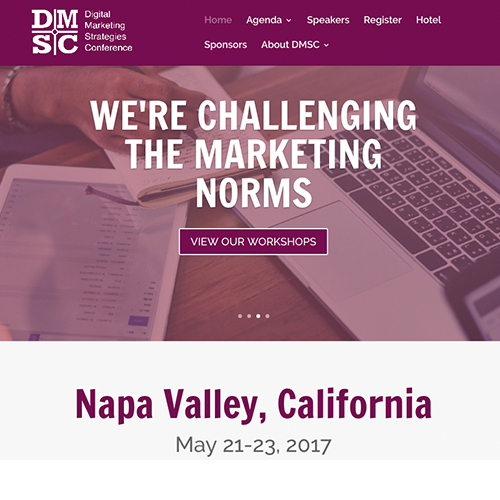 We are pleased to have been invited to speak at DMSC (Digital Marketing Strategies Conference) on May 22, 2017, in Napa, California. The Digital Marketing Strategies Conference is a high-level executive planning event, designed to assist automotive dealers with creating a market-dominating strategy for the year ahead. Held annually, this event brings the top thought leaders from the automotive marketing industry to beautiful Napa Valley for an intimate conference experience unlike any other. This event is for the progressive dealer interested in learning how to be a part of their dealership’s digital strategy and lead their teams in a digital age. Our presentation on the one-price business model is just one of many that will be delivered by industry experts. Ryan Adams Group’s presentation, Why One-Price and Why Now? , kicks off the first day of the conference. We will address how the one-price business model affects recruiting challenges, margin compression, differentiation through customer experience design, e-commerce and speed of transaction. One-price dealer financial composites will illustrate how a one-price business model impacts profitability. Interested in attending? Get information here.